Sinusitis is among the most common diagnoses for those who visit their physician complaining of coughing, sinus pressure, congestion, postnasal drainage and headaches. One in eight adults suffers from sinusitis today. Often, patients misdiagnose themselves as simply suffering from seasonal allergies or a persistent cold. While medications such as nasal sprays, antibiotics and antihistamines can provide temporary relief, many times they do not solve the problem and a surgical procedure may be required. Our practice is now placing the dissolvable PROPEL Sinus Stent at the end of surgery. The lightweight stent helps keep the sinus cavities open after surgery and steadily delivers local anti-inflammatory medication to the healing sinus tissue. 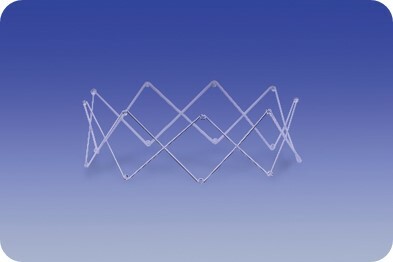 The PROPEL Stent improves patient outcomes and the healing process, plus patients hardly know it is there. PROPEL has been studied in three prospective, randomized clinical trials conducted in the United States demonstrating reduced scarring and reduced need for oral steroids. When a patient’s chronic sinusitis does not respond to medications, surgery to enlarge the opening to drain the sinuses may provide the best option. The PROPEL Sinus Stent offers a new weapon in the fight against chronic sinusitis, backed by clinical data and positive outcomes. The PROPEL Stent is carefully inserted into the sinus cavity at the end of surgery. The stent remains there for a few weeks, utilizing a spring-like mechanism to open up the nasal passageway. At the same time, it provides anti-inflammatory therapy to enhance healing. The stent slowly dissolves on its own, and no removal is necessary, making postoperative care easier on patients. 1. Han JK, Marple BF, Smith TL et al. Int Forum Allergy Rhinol. 2012 2:271-279. 2. Forwith KD, Chandra RK, Yun PT, et al. ADVANCE: A multisite trial of bioabsorbable steroid-eluting sinus implants. Laryngoscope. 2011; 121:2473-2480. The PROPEL sinus implants are intended for use following sinus surgery to maintain the sinus openings and to locally deliver a drug to the sinuses: PROPEL for use in the ethmoid sinus, PROPEL Mini for use in the ethmoid sinus and frontal sinus opening and PROPEL Contour for use in the frontal and maxillary sinus openings. The products are intended for use in patients ≥18 years of age. These products are not intended for people who are, allergic to the drug (mometasone furoate) or to certain polymers. Safety and effectiveness of the implant in pregnant or nursing females have not been studied. Risks may include, but are not limited to, pain/pressure, movement of the implant (within or out of the sinus), possible side effects of the drug, infection, and nose bleed. For more information on the risks and benefits of PROPEL sinus implants, please talk to your doctor. The FDA approved labeling can be found at www.IntersectENT.com. Rx only. INTERSECT ENT and PROPEL are registered trademarks of Intersect ENT, Inc. in the United States and other countries. MySinusitis.com is a trademark of Intersect ENT, Inc.